My latest vintage pattern find was for a bikini circa 1960. I wanted to have a go at making one but I wasn't so keen to wear a flower pot on my head. I ordered swimwear fabric and powernet lining from The Sewing Chest. The fabric piece was a second because it had a pale blue colour run in it but with the swirly pattern it wasn't noticeable at all. The fabric was thicker than I thought it was going to be which I was relieved about. Overall the thing that pleased me most was that it was £7.00 for a really large remnant piece. YUCK! it is curling out and looks like a bad bra not a bikini. I used a bra making method for applying elastic using a 3 stitch zig zag which is a pig to unpick if you decide that in the end it looks rubbish - which it did! The method on the pattern was a bit more crude. The pattern is from 1960 so the use of stretchy fabrics and elastics is not as complex as today. So I unpicked the whole lot over several weeks: the arm holes, neckline, under bust, leg holes, waistband - it was tedious to say the least. Later I applied the elastic in a different way with my serger then topstitched which was much better and they were a super comfy fit. However I couldn't save the top, when I applied the elastic the second time by turning over as above it made it way too small because I lost seam allowance all the way around so I had to sacrifice the first one as 'learning' and make another. I made four modifications - I took some depth out of the shorts, my body is far too short for those in the pattern picture, they would have been scraping the bottom of the bikini top! I took a tiny bit out of the leg arch, added a clasp to the back of the top to get it on and off easily and after much angst I eventually added underwires which sorted the whole droopy bosom thing out really well. I feels great on and all stretches out brilliantly. In my head I reckon I look just like the woman on the packet anyway so no need for a photo really! This one is ready for the suitcase. Vintage pattern swimwear, now there's a pledge. Am I too old for a twin set? Am I too young for a twin set? Who knows but I had to use up my last bit of Liberty fabric in an efficient way before it got cut up for make-up bags or something and that would have been a waste. Sorry, morning hair! I had so many lovely comments about my bloke's jumper which I turned into a cardigan that I wanted to have a top to wear underneath. I wear the cardigan a lot so to have a set seemed like perfection to me. I used my all time favourite vintage pattern ,1967 Simplicity 7642, to make a shell top view 2 with bust darts only. I picked out a vibrant pink for the top as it was hard to get a green that matched the jumper too. There was just enough to do the bottom pieces. I would have preferred the top but there you are. It is a bit chillier today so I am wearing it with cropped green jeans. I am pinning this to my vintage pledge board for 2106. So tell me fashionable people, is a twin set an old or young thing these days? My winter coat, which my dad bought for me, was hanging on the back of the spare room door. I LOVE this Skater duffle coat. I didn't want to use space in my wardrobe to hang it for the winter and it was quite heavy for the rail so I hung it on the back of the door. It is not a good place to hang a wool coat; in front of the window in a dusty room. 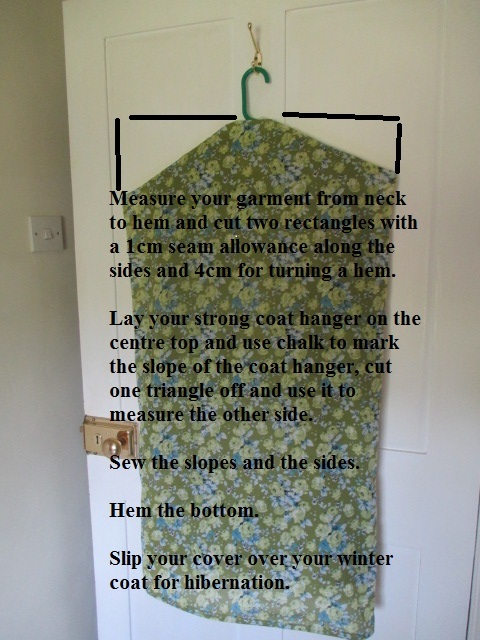 So I made a garment cover in oooh about 30 minutes, here's how I did it. I also used this fabric to cover my clock in the same room. It was also a fabulous fabric to line a crochet bag. I made a handy project bag to take needles and yarn on holiday in July to make my next Minerva make. Can I get needles on a plane? - do tell of your experiences. Finally the last piece was used for a little peg bag. So you see, you don't have to be a super seamstress to enjoy a bit of machine sewing. Those online purchases where you don't get to feel the fabric can always open up new doors. While we are looking at the clock. The Clock kit giveaway winners were Ingrid from Funky crochet and Amy from Love made my home. Congratulations both! The kits are on their way to you at this very moment. I finished a Hitchhiker scarf this week. It is knit in Drops Delight 4ply which comes in a great range of colours at only £2.10 a ball. This scarf used 2 balls. I really enjoyed making it, watching the colour runs develop as it got longer. It is a great pattern which is very flexible. You can knit this in any yarn gauge and any length by following the clear instructions. It is a strange sort of saw shape but drapes really well when you wear it. I blocked it to get sharp 'teeth' and pointy corners. This one is going into my present box for Christmas. Today is mammoth weekend post full of variety and fun. Firstly, on Saturday we went to try and finish jobs on the cabin. We have painted the inside of this one. We wished we had painted the inside of the last one but once the furniture was in we couldn't be bothered to move everything again. This colour is called seagrass by Ronseal. We also varnished the floor (again we wished we had done it before) it means that the we can go in and out with muddy boots so it dries and brushes off. I lost my fabric bunting in the storms that ripped the previous cabin to bits but I have strung up my crochet flowers which look great. The kitchenette survived alongside the general camping paraphernalia so that is all still really functional for hot drinks, easy meals and toast. The girls got all of their washed cosy bed stuff out of the bin bags and loved messing around on the bunk beds. Bloke rigged the solar panel back up so we have lights again. We hung up Big Sis's curtain which looks lovely. There is just the log burner to go but I am still a bit apprehensive about lifting heavy stuff at the moment because I had a bad back a while ago and don't want to risk anything stupid. We need to invite some friends to come and join us for a sit in the sunshine and work as a team to lift it but we don't need it just yet anyway. The outside of this one is different, a lower roof this time without the chalet overhang which catches the wind. We still need to finish painting the outside. All in all we are mighty chuffed with our hard work and thankful to those who have helped put it up - you know who you are!! Everything is really green, including the ever growing pondweed, but we still managed to do some pond dipping. The tadpoles have legs, then we caught two of these huge things - a dragonfly nymph of some description which was about 12cm long. I took the girls round the pond for a mooch. Little M loves looking for the seething tadpole masses and then waiting for dragonflies to land on her; she considers it a wasted trip if one doesn't land on her arm. On Saturday evening we went to a music festival in our village/town to listen to live music, have a dance, meet friends and generally have a late night with the children. That is a sweaty Megan after dancing to 'Hang the DJ' by The Smiths gone 10pm on Saturday night. On Sunday, Big Sis was singing in a choir on the second festival day. She is quite shy so it was a good chance to be with others to perform on the big stage. 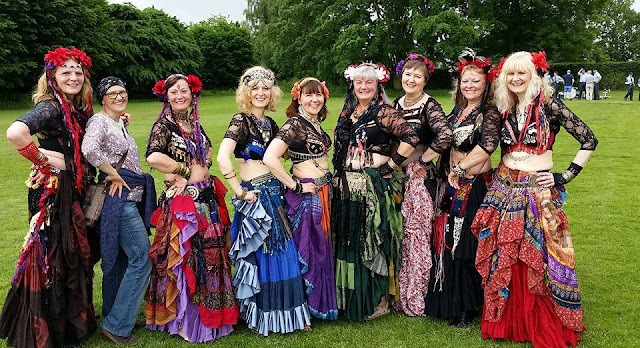 I was performing too with my Tribal Belly dance friends unfortunately it was raining for one spot and my tie dye skirt was rapidly soaking up water! But it was fun anyway. Do you know, I am absolutely wiped out today, kind of glad it is raining! I had a strange shaped piece of cotton poplin left over from my Fi Fi set due to cutting on the bias which little M loved. So I set about making her a summer top/tunic/vest thingy to use it up. My girls like these because they wear them on their own or with long sleeved or short sleeved T-shirts underneath depending on the UK weather which is pretty wet at present. I am quite organised but I even surprise myself sometimes. I found a brown envelope in my pattern box and in it was a traced off pattern for a clothkits pinafore aged 6. I made this dress with Big Sis when she was little and must have had the forethought to trace it onto baking paper before we sewed it together in case I wanted to make another with her little sister when she was older. I had even stuck on photos to remind me - I don't even remember doing this! I seem to have made loads more bias binding than I needed for the PJ set so I used this to finish the back and the armholes. I added the pockets myself and couldn't resist creating the applique apple details. She is six now and one day this sort of fun girls clothing will not be wanted so I am indulging myself a little. On the first try on I had 'apparently' shortened the dress pattern too much and she said it was too short so the next night I added the frill to give it another couple of inches. I used up the rest of the vintage pearly poppas I had in my stash for the back, which I have since discovered can be bought here. The button placket was another detail that made it a real corker of a top. Here's hoping for a whole day of blue skies rather than snippets between showers. One of my New Years resolutions for 2106 was to learn to knit nordic style. In my fantasy world I was harking back to my skiing days. I envisaged a navy, red and white skiing jumper in wool with an intricate pattern that didn't itch, I would be sipping gluwein in a wooden chalet and throwing my head back laughing something like,'what this? it was so easy to knit!' But in reality I just wanted a challenge and to learn something new because you know how I love being a 'jack of all trades....' I also believe 'variety is the spice of life' and all that. I chose a swatch knit from the book Nordic Knit by Eline Oftedal then fashioned a camera case out of it, ever functional me. My bessie bought me the book for Christmas and she doesn't knit so much now so I suspect she thinks I am better than I really am hence the new years resolution. It is a beautiful book and has been lounging on the coffee table since December looking all Scandinavian and inviting. OK so it is not a jumper obviously but I really enjoyed a knit that was challenging enough to keep me looking. Even the mattress stitch join on the back pleased me. The yarn is the leftovers from my crochet bag here. King Cole Merino from Minerva. Big things grow from small seeds so I will see where this takes me over the next few years - maybe I will get that ski jumper one day. Can anyone signpost me to anything else easy to break me in?